About a week ago, somewhere between the Sahara Desert and Istanbul, I was composing this blog entry in my mind. I was certain this reflection would be the first recollection I would share. Since I rely on the Spirit to prompt my writing, it is evident a few other things needed to come from my heart and mind first. For those of you who know my personal story, my parent’s legacy has been quite impactful on my adult life. My father passed away in 1977 when I was nine years old after a short battle with cancer. My mother passed away just four years ago having lived a full life, and then another. Mom and I were close after dad passed on. I am the youngest of seven daughters; ten girls if you count their premature births that did not survive. Mom was nearly 40 when I was born. Despite our generation gap, she depended on our relationship to keep going. She missed dad so much and struggled with widowhood depression. We didn’t have a perfect relationship but we were able to talk about most everything. I recall desperately wanting to escape life in a small town my senior year of high school but being anxious to go home for visits soon after graduation. I was so naïve. Mom contracted Meningitis in my early 20’s. I barely recall adulthood with a parent to consult. I was busy stretching my wings. Moms illness is documented in medical journals somewhere, as she really shouldn’t have survived. As I recall, a doctor dismissed her delusions and physical symptoms as depression. Within 24 hours of psychiatric care, it was evident her condition was caused by something other than a chemical imbalance. I married in 1992 at age 25 and the following year, mom’s brain tissue began to heal. We were told it would take approximately five years for healing to become evident. Once she started to come alive, her faith was more deeply rooted than ever. Having lost her home to cover the cost of nursing home care, mom needed to lean into God for some answers. She always said He kept her here for a reason and she was determined to be a witness until He took her home. We would bring mom to our home as often as possible. We lived in a ranch-style home so it was easy for her to get around. In later years, my sweet and patient husband suggested we take mom on a Florida vacation with us. Viewing our photos from an earlier trip to Orlando, she mentioned to David she had never gotten to see Epcot completed. She traveled with another widow friend who was a travel agent but became ill at such a young age. Bless God for David; with our little girl turning six years old, we took mom on that trip for a multigenerational getaway. A few years later, mom also joined our family on an incentive trip earned through my Stampin’ Up! business. She never dreamed she would go on a cruise much less one that traveled through the Panama Canal. The ship was chartered for our group so traveling with her was ideal. It was a bundle of memories we will never forget. A few years later, mom had a stroke. She was never the same after the stroke but seemed to keep her sense of humor. We moved mom from northern Wisconsin to a beautiful facility in West Bend for rehabilitation so more family members could visit and assist with her care and companionship. She was there from July to the following March—such a short time yet it seemed long as she struggled with dementia, often telling us dad had come for a visit. Dad was a well-respected man in our community. He was the postmaster in our small town so I have some fond memories of looking up to him as he interacted with folks from all around. Locals and vacationers alike seemed to admire him. I have just a few memories of dad. Between the post office and our home there were a few taverns. I am certain the companionship of menfolk was more appealing than returning home to a house full of bickering women. Girls tend to squabble. As the years went on, his return home was later and later. This concerned my older sisters after his passing but I was none the wiser as a youngster. We enjoyed camping and a garden plot our family was able to use the summer dad discovered the cancer. The memories were few but I cherish those we had. For years I tried to figure out what love was. I looked for it in all the wrong places—the wrong people—the wrong kind of love. When I became a mother at age 30, I started to get an idea of unconditional love. It has been a process over the last 17 years but I finally figured out what love truly is. As I set out to visit Rwanda with our team from church, we met to prepare our evangelism message during our visits. The first gathering, Julie started the meeting centering us on 1 Corinthians 13. I wrote a blog about this [link here]. A few months later I left for my first international trip with dads message on my heart and mind knowing I would taking his legacy further than I had ever dreamed. After mom passed away, I was certain I would feel her spiritual presence in my life. I rarely felt it and only surmised she was needed elsewhere or enjoying her new home in heaven (if that’s how the afterlife works). I had peace with our relationship and could carry on with no regrets of what should have been. One day before leaving for Rwanda, it occurred to me that I was going to be ministering to widows. I hadn’t thought about how the many years of sharing my heart and listening to mom was preparing me for such a time as this. I embarked on this journey carrying the legacy of both of my parents. For years I felt like an orphan myself, having missed the typical adult-parent relationship with either a mother or father. The pain the orphans of the genocide endured is incomparable with my own experience yet somehow I felt as though God as using my experience to prepare my heart and mind. These feelings are the kind I recounted as I wandered about the memorial gardens trying to figure out the emotions I couldn’t comprehend– why I concluded I couldn’t cry. I was all cried out but felt self-centered just the same. I have chronicled my experiences about the trip on previous days that you may have read. If not, please consider visiting blog posts from earlier this week. In light of the emotional turbulence I settled during my time in Africa, the discovery on my final day is just short of miraculous. Our team enjoyed an intimate worship gathering on Sunday morning. It was great to share our hearts as we saw one another with transparency throughout the week. An experience such as this puts a punctuation mark on the idea that God had His hand in the selection of our team. He is so good. As we packed our bags to prepare for departure, I opened the front zipper pocket of the suitcase. I hadn’t brought this piece of luggage to Rwanda personally as it contained supplies for the team. 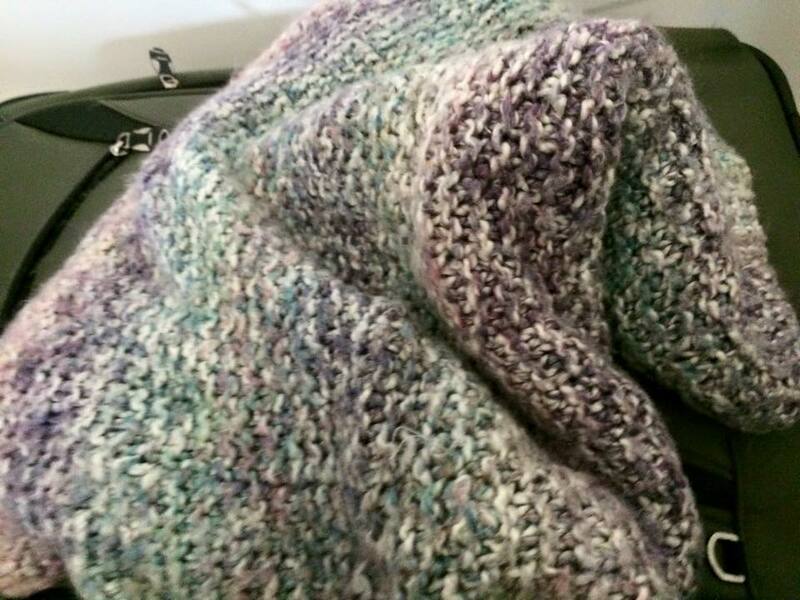 In the front zipper pocket I discovered my mom’s crocheted prayer shawl. It had been packed into the suitcase the night of her passing as my sister and I cleared her room at the nursing home. It was simply overlooked as I unpacked the luggage into boxes to donate her clothes soon after her funeral. We hadn’t taken a family vacation in the last four years, so the shawl was undiscovered—unknown until such a time as this, when I needed affirmation that she still traveled with me. It was a material item and I am not a material girl. I hold my treasures in my heart. But on that day, which was also my only child’s 17th birthday, I was given a tangible gift like no other. I had peace to be away from my baby on such an important day and peace to be without my own mom. On that day, I cried. I cried joyful tears because God really does care about the details. So the next day, somewhere over the beautiful Mediterranean Sea, I listened to worship songs to affirm my faith. It was a wee little seed, planted when I was young. Although it remained dormant in the soil for many years, it was well watered by the rain of grace in Africa. I reached over to hold the hand of my new friend who was my roommate on the trip, leaned my head on her shoulder, just as I used to do with my mom, and I bawled my eyes out. When I was a young girl, I learned to talk to God as if He was my earthly father. I was never orphaned at all. In many ways, I’ve been better cared for than if my dad would have survived his cancer. As much as I would love to have just one adult conversation with him, I have peace knowing we have all eternity to catch up—as if it will even matter then.